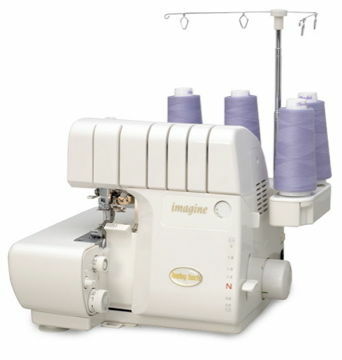 Threading this serger has never been easier than with the revolutionary Jet-Air Threading from Baby Lock. With just one touch of a lever, thread is sent through the tubular loopers. There are no thread guides and no more struggling. *LOL* Maybe I should make more machine suggestions! I'm looking at one too...so let me know how you like it! I have that machine, it is fantastic. You won't regret it. I have the Evolve from Babylock and I LOOOOOOOOOOVVVVVVEE it. You will never regret the jet air threading. It makes serging so easy. Changing threads is a breeze and the auto tension eliminates the need to set the dials. I have the Evolve and I love it. Not only easy to thread but stitching is perfect all the time without fail. I'm sure you'd love this machine. Trust me on this - I've had 3 sergers. You NEED jet-air threading. My other 2 sergers were top of the line sergers, but they took the joy out of serging because of threading and tension issues. I bought a Babylock Imagine off of Craigslist for $600. With careful screening, it can be done. Even if you pay retail price, it is so worth it. Beautiful. I want one too. Hello! I am tickled pink that you dropped by to say 'hi.' Thank you, I am very blessed and looking forward to all that the future holds for me! Girl, that sewing talent of yours is amazing! Very nice ! I don't know what I'd do with it but I would like one ! I have been drooling over this machine and the more expensive evolve model for over a year. In Australia they retail for over $3000! Do you pull your threads through when you change colors? It makes it so much easier. Just cut the threads at the top and tie on the new thread and pull them through. I've had two sergers and they both did this a little differently (minor little things). I hardly ever rethread. The Babylock is nice but if you don't have the $$$ right now you can try this method. As for tensions, I make samples and write down what my tensions were. That way I can refer to it next time I sew fabric like that. Just some hints. Good luck!!! I've finally calmed my racing heart. I must admit that I was watching on Ebay a Babylock Imagine Serger, finally jumped in the bidding process and loss. Well after that I took a closer look at how I was using my machine and it wasn't the machine... it was me. I was trying to feed too much fabric and in turn causing the serger to buck and then the lower looper thread would break. As anyone knows feeding the lower looper thread in is a PITA. Thanks Kerri for your help. I remember when I initially received my serger and being a newbie sat there are removed all the threads from the machine...uggh Only to realize all that was needed was cutting the spool threads @ the top and tying the new threads to the existing threads.... lesson learned. That is the reason I use white thread for light clothing and black for dark - my darn Singer Serger is just too damn hard to thread.